Anti-snoring sprays may be an easy solution to the problem of snoring, but choosing the right one can be incredibly hard. However, once you know which features to focus on and what constitutes a good anti-snoring spray, you are just a step away from making the right decision. 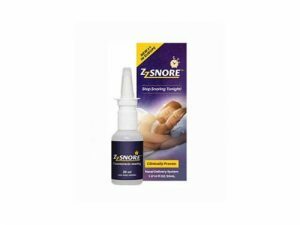 This Zz Snore VS Rhynil Spray comparison can help you find out which one of these two products is superior to the other and thus a better match for your needs. Rhynil Spray is a herbal product with antiseptic and antibacterial properties that does not only prevent snoring but also helps you combat nasty sinus infections. Designed both for oral and nasal use, it’s one of the easiest snoring solutions. Rhynil Spray for Nose & Mouth (35ml) typically lasts 1 month if used regularly. This translates to around 350 sprays. Rhynil Spray for Nose & Mouth contains: - Water - Euphrasia Tincture - Disodium Orthophosphate - Citric Acid - Potassium sorbate These are all-natural herb ingredients. Rhynil Spray for Nose & Mouth is based on a formula that has proven its effectiveness over the last 20 years. This spray is an improvement over its previous version known as the Snore Calm Herbal Spray. Apart from lubricating the soft tissue in your nose, mouth, and throat, the spray also has anti-bacterial and antiseptic properties. You should see the first results in just a couple of days. Rhynil Spray for Nose & Mouth has no known side effects. Due to the nature of the product, Rhynil Spray for Nose & Mouth cannot be returned to the manufacturer. Due to the nature of the product, Rhynil Spray for Nose & Mouth does not come with a warranty.